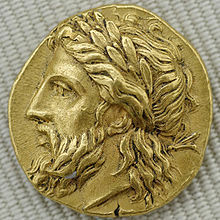 Coin of Zeus. The man is supposed to be Zeus, but it was on wikipedia, which I don't trust ery much anymore. Wallpaper and background images in the The Heroes of Olympus club tagged: the lost hero the heroes of olympus coin sword zeus jason. me 2 i want it! OMG!! !Is that Jason's coin-weapon thingy? there should be one of those im my house.